Hello my friends! 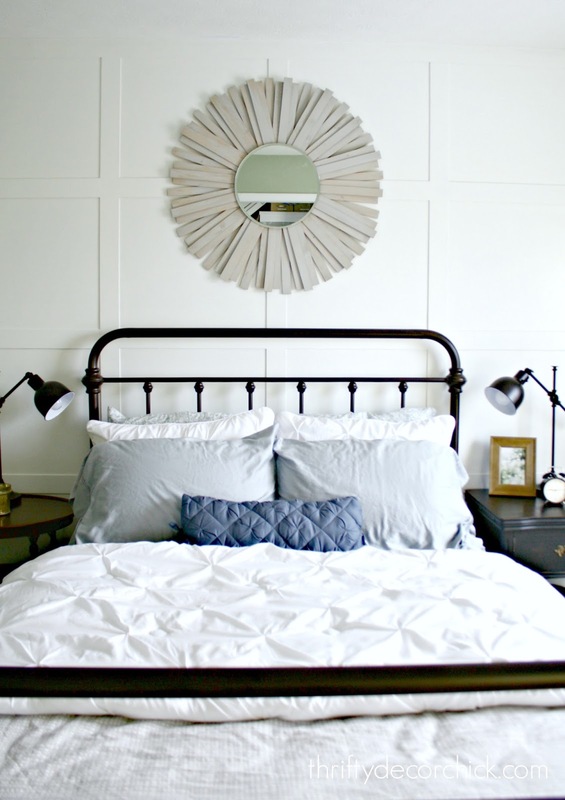 I'm so thrilled with a couple changes I made to the guest bedroom and couldn't wait to show you. I swear, if I didn't blog I wouldn't get half of this stuff done in our house! It's a good thing, but if I didn't blog I'm guessing we'd always have clean clothes, so there's a trade off there. 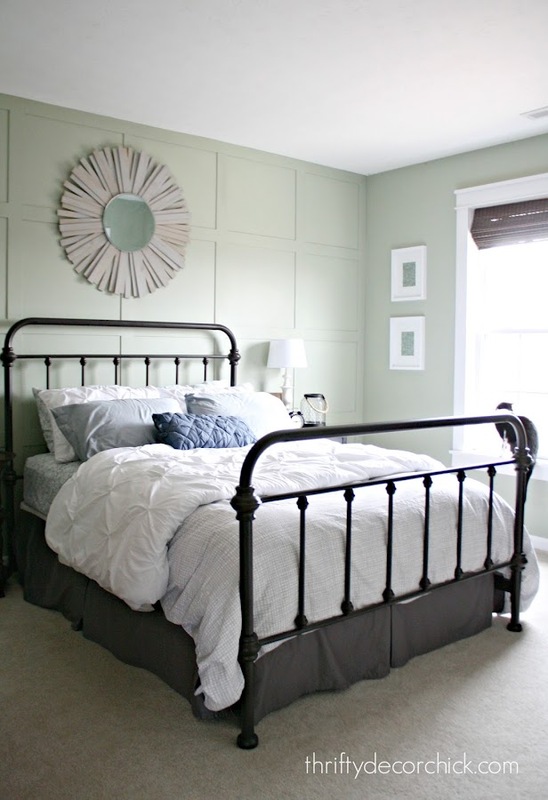 The Softened Green wall color in this room was inspired by this photo. But as you can see in the pic, that white wall behind the bed really makes everything pop. So I decided to finally change that back wall to white. What I thought would take a little over an hour ended up taking more than four, but more on that in a bit. The description says it's bronze but it's more black to me. I think it goes so perfectly with the cottagey feel in this room! I absolutely love them against the new white wall! Contrast is my JAM. Although as hard as I try, not having matching nightstands is not my jam. I've tried to do it over the years and it makes me twitch. I am a lover of symmetry and just need to go with it. 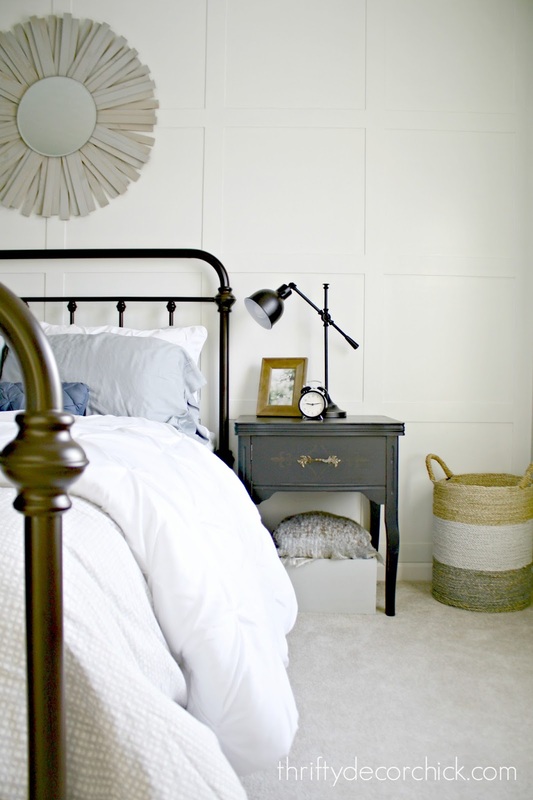 So one of the last changes to this space will be to find simple matching nightstands. Not an easy feat as I'm trying to redo this whole room on a very small budget. The power of paint is strong my friends. The white ties everything together in here -- the wall across from this one has the big sliding closet doors in white as well. It also ties in the pretty window woodwork I added last year. 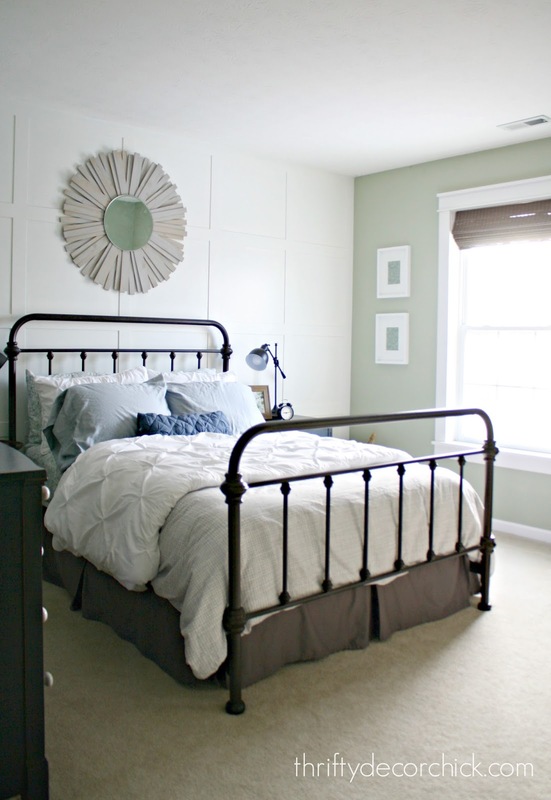 Here are some more posts about this room that you may find helpful! I received compensation from BHG at Walmart for my time and participation in the BHG Live Better Network. All experiences and opinions are my own. Follow BHG on Twitter, Facebook, Instagram or Pinterest. I *think* I found the source of your inspiration image! Looks like it might be by Tom Stringer Design Partners! Fun tip: you can use www.tineye.com to do a 'reverse image search' to find a photo's source! With the advent of pinterest and houzz, you'll have to dig through other people's use of the same photo but it took about 3 minutes to figure out the original source. I will check this out, thank you! I use that site and did for this one -- it must have been buried! Thanks! That's it. It says Photo Credit: Werner Straube. 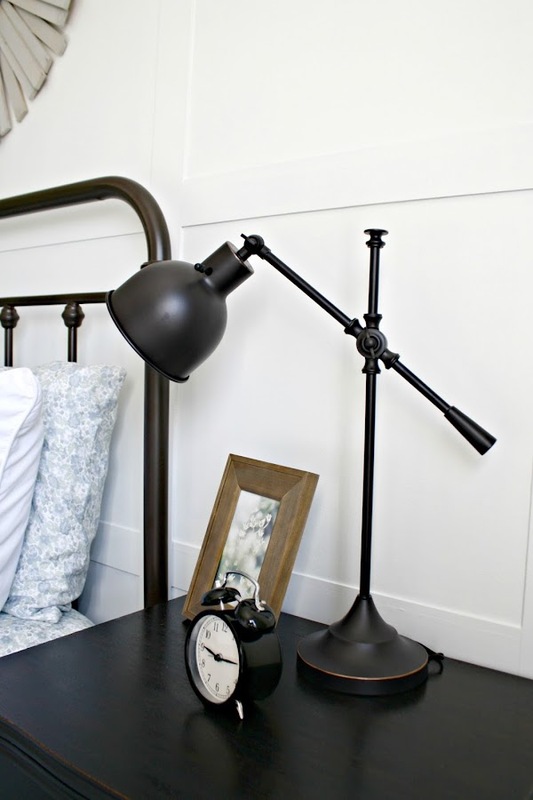 What about an Ikea rast hack for your nightstands? I would LOVE to see what you would do with those!! i love the white wall!! I guess he pelmet from the mattress to the floor is hiding stored items. If you can find room elswhere, nothing under a bed like that is awsome! 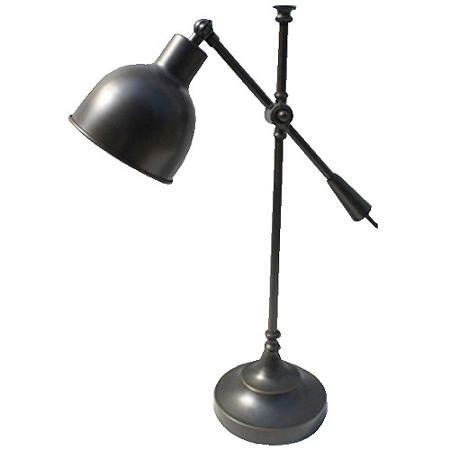 (I have one similar in white and it sits on a wooden floor). I like the white wall as well as it definitely brightens the room. Your black side table looks suspiciously like a sewing machine cabinet! I like the contrast of black and white. I am a matching nightstands person too. I bought 2 Ikea Tarva nightstands for only $39 each. I then stained mine with Minwax Special Walnut. My bedroom furniture is Broyhil Pleasant Isle, but they not longer make it. I needed nightstands for years, but never found anything. I like that my nightstands match each other, but are a different color than the rest of the furniture. I'm planning to stain some picture frames to put in there as well. I loved the wicker and needed (matching)bedside tables but couldn't spend much. I used them but hated how the stuff sat inside the tray and you couldn't see it. I even tried stacking books--it just didn't work. So I flipped the tray over and then added a wood tray to each for solid bases. Does that make sense? I love them so much more now--they are functional and pretty! The great thing--inexpensive and they match. A guest room would be good for this as they are not super sturdy but add a lot of warmth and texture which I love. We painted ours white too. Made a difference and helped the accent wall stand out in contrast. It also made all the other things going on feel more cohesive. Did you stain the sunburst mirror? The color looks different. Lovely! The combo of black metal with all the white looks amazing. Might just have to try it out at our home too. LOVE LOVE LOVE that inspiration pic...I pinned for myself...I am a huge fan of anything green and that shade of green on that chair is just YUMMY!! Thanks for sharing..I've tucked it away for inspiration for our room. By the way your new bed is so pretty. I don't think I can talk the hubby into buying a new bed, but I might just paint my current one black!! I LOVE the inspiration picture, that bedroom is gorgeous! I really like the green on your walls, the white wall, your bed and lamps. All together, it makes for a very pulled together look. Since your green is so soft, I think it would be really pretty if you added a bolder contrasting color for the bedding and pillows. Is the decorative pillow on the bed a blue shade? Tom Stringer Design Partners did the black, white, green BR...2014, I think. It's been the inspiration for my twin BR since first sight. I'm obsessed with that bed! Awesome! The bed is gorgeous! And yes, the white background works nicely. Green accents? Bring them on.. beautiful!